crackle, and metal finishes. We can duplicate a natural look of stone, marble, or wood on any of the walls in your house. 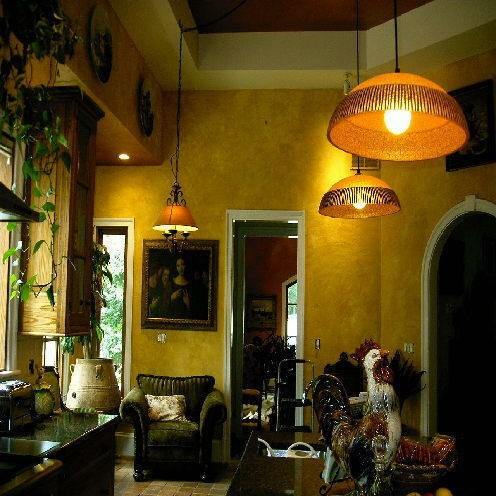 Faux finish painting techniques can be applied to almost all surfaces, including dry wall, sheet rock, plastering, wood, metal, fabric, glass, and ceramic, remembering that the preparation and priming of the surface will vary from one material to another. Longer lasting than wallpaper, faux finish painting also provides the advantage of practicality. Because it does not have seams, it will not peal off under adverse environmental effects such as found in the Arizona climate. Additionally, faux finish painting becomes more beautiful with age. If ever required, faux painting touch ups and repairs are accomplished very easily. Faux painting can also be top-coated with a polyurethane, in matte, satin, or semi-gloss finish. Faux finish painting can also change the perceived size of any area, (remember, faux is to make believe or to fool). With faux finish painting, you can make a smaller area appear larger by using lighter colors and a soft technique. Faux painting can also make a large area appear smaller by using dark colors and a dramatic technique. -Additionally, Creative Man Painting offers many solid finish services for your interior, exterior, or commercial painting needs, using your choice of colors to complement any faux painting look you want. Faux finishes—a French word which means ”false” or ”artificial”—used to be strictly the preserve of the professional decorator. All faux finishes are carried out by hand, with the result that each one is absolutely unique, giving the surfaces and objects you use them on a truly personal touch. The following images are some of the jobs we have been working on. These images might give you an idea of what we are capable of doing. It's like the saying "Your imagination is the limit".